I first stumbled across Kava Roots when looking for somewhere to play live music and listen to others jam. 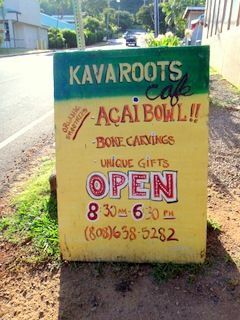 Kava Roots is located across from Three Tables Beach on the North Shore of Oahu across the street from the Foodland. They sell fresh fruit smoothies, acai bowls, kava, and even things made by locals like boardshorts, other beachwear and bone carvings. Every weekend they have open mic nights from about 7pm to 11pm. Anyone can play so long as they sign up on the white board earlier in the day, and if there are open slots, then you don’t need to be on the list at all. The acai bowls here are incredible. They are very large and worth their price. They are made by blending acai berry puree with apple juice, bananas, honey and ice, then are topped with granola, sliced bananas, and a drizzle of honey. For those of you unfamiliar with the acai berry, it is known to increases energy and stamina, fight cancer, disease and obesity, boost the immune system, help with digestion, and benefit us in several other ways. Aside from the health benefits, acai bowls at Kava Roots are really good. I have had acai bowls all over the island and in several places in California and none of them compare to the acai bowls at Kava Roots on the North Shore. Then you have the live music and kava nights on the weekends. Kava is a very popular drink throughout Polynesia made by mixing water with the moisture and powder from the ground up roots of the kava plant. To some people it tastes like dirt, and to others it is very good. It sometimes makes your tongue and mouth feel a little numb, and can put you in a very relaxed state. On weekends you can have bottomless kava drinks for $5.00, while listening to North Shore locals play live music. If you want to play some music at Kava Roots, all the equipment is already there, so you don’t even have to bring your own instruments. They have microphones and a PA system, guitars, a bass guitar and a drum set. I have played there several times with one of my friends and also with some of the local guys. If you’re sitting around on a weekend night and looking for something relaxing to do, then head over the Kava Roots, get an acai bowl and maybe some kava, and listen to the local talent on the North Shore of Oahu.